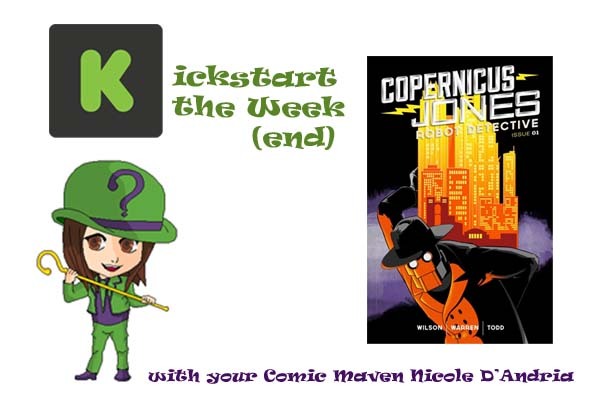 This weekend I’m showcasing the Kickstarter for Copernicus Jones: Robot Detective Vol. 1. Enjoy robots and the mob in these first six issues of the Copernicus Jones story “Dirty Credits.” The book will also feature a print-exclusive forward by Greg Rucka (Gotham Central, Lazarus, Stumptown). 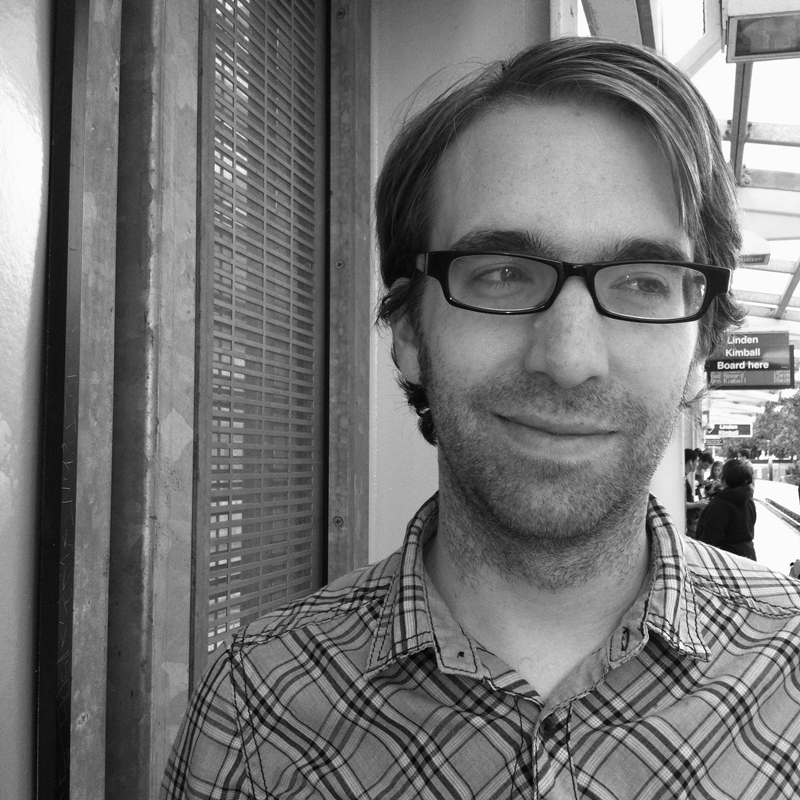 In this “Kickstart the Week(end)” you'll also hear from writer and humorist Matt Wilson. 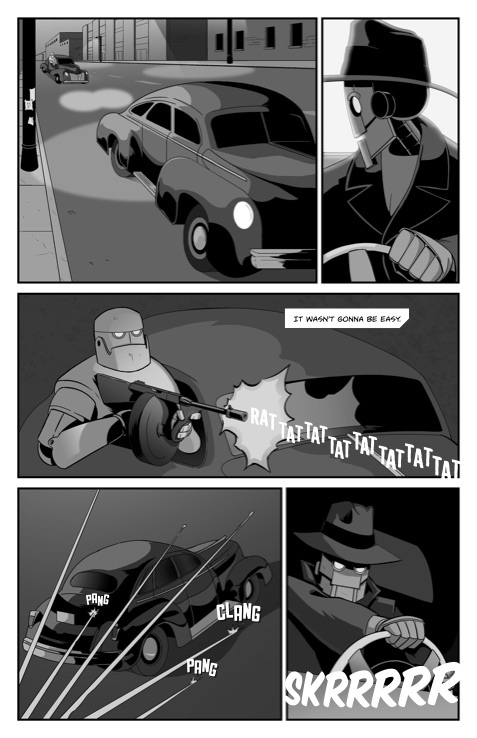 Copernicus Jones: Robot Detective Volume 1 features protagonist PI Copernicus Jones. In his first story, Copernicus is trying to find out why a tycoon is meeting with mobsters so he can pay off his gambling debts. Unfortunately for him, he sees too much, and since he can’t “sleep” with the fishes, the mob just might have to unplug his circuits. But even if he isn’t zapped, the answers Copernicus thinks he knows have their questions changed. The first six issues of Copernicus Jones were published digitally by MonkeyBrain Comics and they are available on comiXology. The writer of the series is humorist Matt Wilson (The Supervillain Handbook, The Supervillain Field Manual). The artwork is done by Kevin Warren, a freelance artist and stay-at-home dad. The letters and designs were created by Dylan Todd (bigredrobot.net). Over $5,000 has already been pledged to successfully fund Copernicus Jones but there is still time to pledge more. The campaign will end on July 1st, 2015 at 12:00 PM EDT. 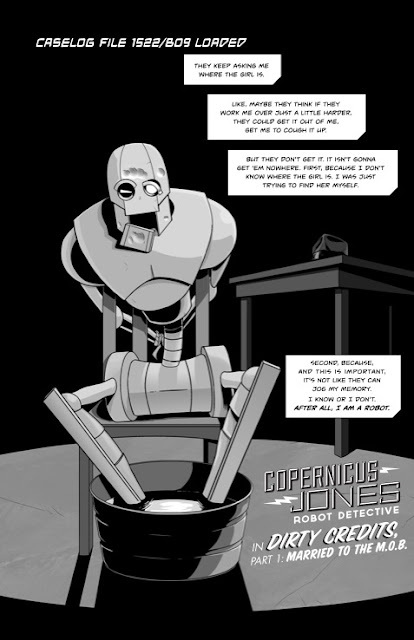 You can pledge money to Copernicus Jones: Robot Detective Vol. 1 on their Kickstarter. For at least $5 or more you will get Backer-Exclusive Digital Art. At $15 you will get a physical copy of the first volume and be able to enjoy all 112 pages. Me: You mention on your Kickstarter that there were many roadblocks to getting the series published by a traditional publisher. What were some of these roadblocks and why was the comic book being in black-and-white a factor? Matt Wilson: I think black-and-white just makes it a harder sell when you're talking about big print runs and that kind of thing. If this was anything else, we could have collaborated with a colorist and made it a color book, but for the genre we're doing--specifically a movie-style noir--black-and-white is a pretty important. I think the genre may have made it a tougher sell for publishers, too. It's a little niche. But the Kickstarter and our digital output has proved that a pretty decent number of people are interested in it. That's validating. Me: Why did you decide to make Copernicus a robotic private eye rather than just a human PI? Wilson: The real, honest answer is that the whole idea of Copernicus Jones started as a joke. Years ago, I just came up with this combination of a funny name and funny occupation, "Copernicus Jones: Robot Detective." He got stuck in my head as that, and that got me going on the idea. Beyond that, I've always been really fascinated by what people in the past believed the future would be. 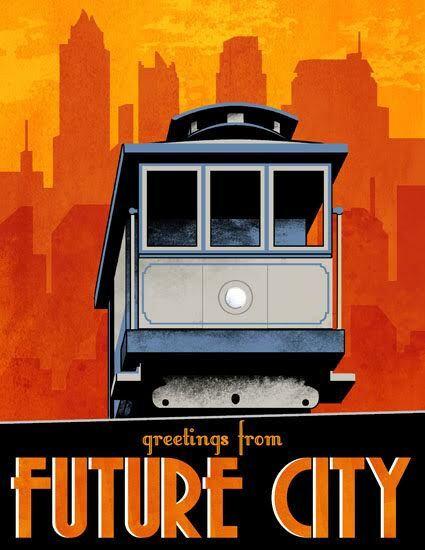 Go back and look at that future-art-deco stuff from the 1930s and 1940s. It was all these automatons doing human jobs, making life infinitely easier. That stuff inspired not only the aesthetic of Copernicus Jones, but the idea that sentient robots might take the jobs humans just don't want to do, or view as dangerous. Copernicus started as a police robot, and through a series of events we haven't explored in the book just yet, he decided to strike out on his own as a PI. Me: How would you describe Copernicus’s personality? Wilson: He's a little peculiar. He's super inquisitive, and a little gruff at times. The people and robots around him don't often know what to make of him, because he's this weird robot who wears clothes and talks like he's Humphrey Bogart. So he's kind of always fighting to prove his value, and may have a bit of a chip on his shoulder. (That's not a pun, I promise.) At the same time, he really cares about his clients and about the cases he works. He's extremely dedicated, and has as much of a moral compass as a robot can have. Me: If Copernicus Jones could hang out with one other robot from any medium, who would it be and why? Wilson: Copernicus would want to spend time with a robot he'd have to figure out, one that's complex and that doesn't put all its cards on the table immediately. So maybe Ultron? That'd be less hanging out than investigating, but it's what Copernicus does. Me: You also wrote two books about supervillains: The Supervillain Handbook and The Supervillain Field Manual. Can you tell us about the villains in Copernicus Jones? Do they follow the logic laid down in these books? Wilson: They're generally cut from a different cloth. In those books, I'm writing from the perspective of an archetypical, comic-book-style megalomaniac. That's not often what noir villains are like, and that's what I'm going for with Copernicus Jones. Noir villains generally turn out to be people who do bad things because they've been hurt somehow, and end up being sympathetic in the end. Then again, there are noir characters like Noah Cross from Chinatown, the types who turn out to be power-hungry and unrepentant. Those are probably more in-line with the supervillains from the other books. And Copernicus will face some of those types, too. Me: Humor can be very hit-and-miss for some people. As a humorist, how do you try and make sure there are more hits than misses when you’re incorporating humor into your work? Wilson: I think it has to serve the story, or, at the very least, not get in the way of it. There are lots of little jokes in the background of Copernicus Jones, and there are some exchanges between characters that I hope might get a laugh out of a reader, but I never want it to distract from the reader's interest in the narrative. That's the main thing there. Actually, Copernicus Jones started as an attempt to be much funnier, a full-on parody, and then it morphed into a more serious story. Sometimes that just happens. I guess I really wanted to avoid the misses. Me: What advice do you have for aspiring writers? Wilson: I'd tell them to stop aspiring and just write. Write every day. Think about your stories, characters and settings any time you get a chance to. Create something and get it out into the world however you can. People--including editors and publishers--don't want to hear "I want to write a thing." Lots of people say that and then never do it. What they want to hear is "I wrote a thing that I can show you." They may reject it, but they can't deny you did it.